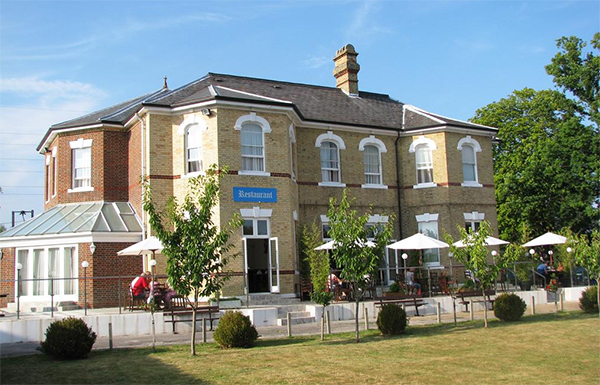 The Russ Hill Hotel Gatwick was built in the 1880s as a Country Manor House and is set in 9 acres of beautiful tranquil grounds, a stark contrast to the hustle and bustle of the nearby Gatwick Airport. The Russ Hill routinely offers the very cheapest hotel and parking deals for Gatwick Airport.. The Russ Hill Hotel proposition includes all the basics you need from an airport hotel, 24-hour front desk, free wi-fi, restaurant or bar meals in the bar.. Rooms available: Singles, Doubles/Twins. Family rooms available for 2 adults and up to 2 children. Car parking is at the hotel, you keep hold of your car keys. Transfers are by taxi, run on demand and take 15 minutes. Price with the recommended local taxi company for the hotel was last advised as £9 each way for up to 4 passengers. Rooms: Rooms are of different shapes and sizes. Each room has an en-suite bathroom, TV, , tea & coffee making facilities and hair dryer. It is also available in bedrooms for up to 40 minutes free. For 24 hours wi-fi is £7 per device. Room service: Room service is available for a small charge. Ruspers Restaurant offers a traditional roast dinner each evening with a selection of promotional dishes. The bar offers a selection of snacks such as freshly made sandwiches and baguettes.